I must admit that I love this class almost too much and Junelle is easily the best teacher ever. I've never had an online class where I actually talked to the teacher and she talks back! I love when she asks us what we think, just like we could answer her and, I do! Heehee She makes me laugh and she makes me want to color outside the lines! I've never had such dirty hands and am learning that glue not only sticks to paper, but to hands! I love my comfort zone, who doesn't, but I'm also learning to love being way outside of it. These are my first sheep, but they won't be my last! This was a class from week two, at least I think so, I've bounced back and forth so many times and looked at videos all of the way to the end of the third week, so I'm not for sure, but I know it was one heck of a fun class. 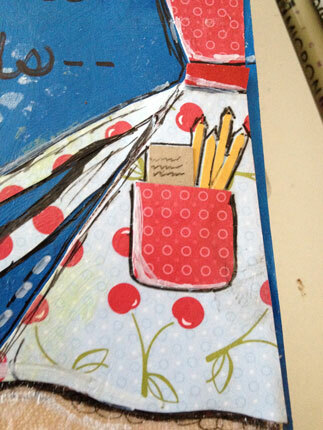 So this was the beginning - I started an art journal in an old book. 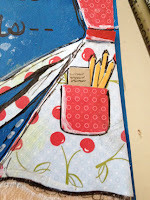 Junelle showed us how to make our own art journal and so I've given it a try. I gessoed the pages and then painted them with several different shades of blue acrylic paint. Cut out circles for the sheep and modified circles for the heads and ears and stuck them on the body using dimensionals to raise them and give more dimension. 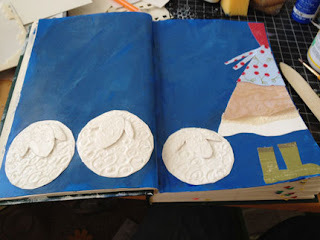 Then I put modeling paste on the bodies ( a little on the heads and ears) and using the end of a paint brush I drew circles to make them look curly. After all, these are wooly sheep, not time for sharing yet! The girl is made using various papers, layering to make an apron and skirt. I used a piece of fabric that I modgepodged to make it stiff and added a little ruffle of lace and her muddy boots, well, they don't have legs yet, but they will! And here they are - legs and a close up of the skirt. 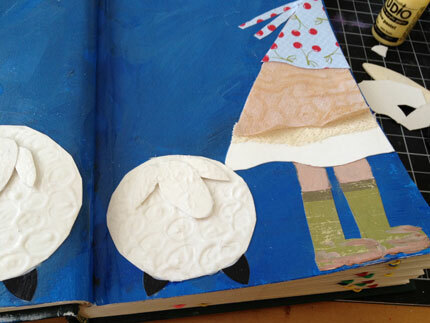 I also added some feet as I noticed my sheep were floating! What will I add now, I'm thinking a pocket with a journal and some pencils would be good and Junelle says sheep are never clean and white, so I must add some coloring! And see how I lifted the head and ears - really does add to the look and, of course, some little pink cheeks! 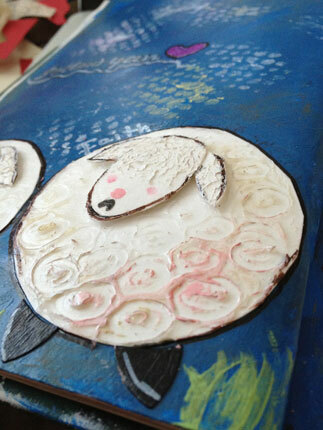 I'm not for sure about that pink - it it a nose and the black it's mouth or have I just changed the look of sheep? Oh, my well it's my interpretation and so it will stay! To the right you get to see that great little pocket - I just wish this girl was me and I was really out walking with sheep following a long behind me - Oh, Junelle, you are a very blessed woman! To work on a sheep ranch! To help with the lambing, what a blessing. I'm so glad you have shared your love of sheep with me (us) and it's such a wonderful reminder of the great shepherd. I am so thankful to be watched over and led by my shepherd. This is a perfect time to stop and read Psalm 23 and be reminded of His great love. 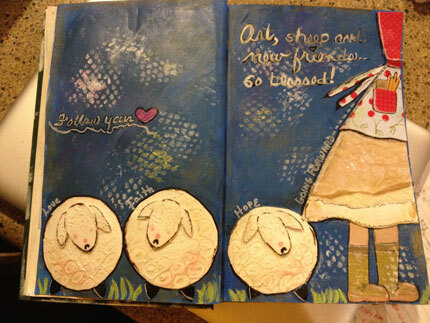 I added some journaling and the white, well, not here in Texas for sure, but Junelle says they have snow fall during lambing! Snow in the spring - wow, we just have flowers and heat, but thanks for the thought and it was fun adding it to the picture as I imagined the cool, crisp air. 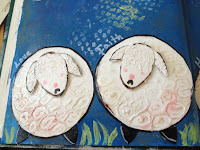 As it says on picture - Art, sheep and new friends, I am so blessed! I will post my flowers soon. She really surprised me on that one. I've been painting flowers forever, so thought it would be a breeze! No, no, no - a whole new way of making flowers, so once again I was forced to color outside the lines! What an amazing adventure - you rally need to check out this class. The "live" three weeks are now ended, but it will be up for a year - so, check it out here.